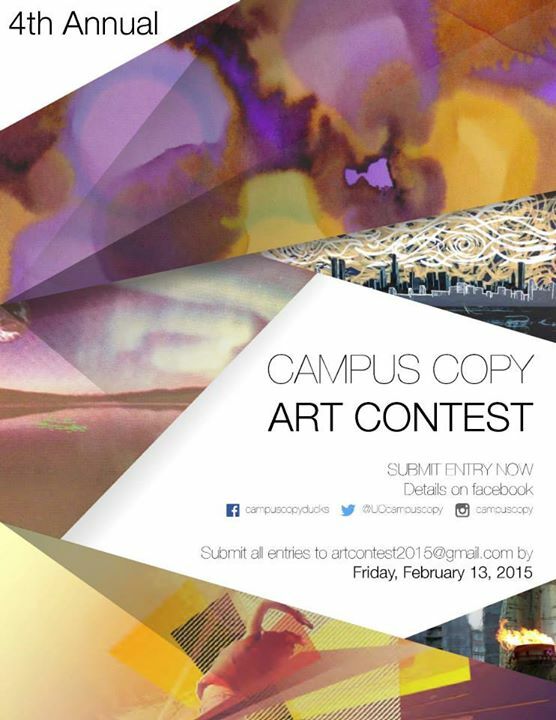 The Campus Copy Art Contest is now accepting entries from all campus-based artists. The fourth annual contest is open to students, faculty and staff, and submitted entries can be photographs, digital or painted artwork. Created by UO Printing and Mailing Services, the contest had 186 entries last year representing a range of subjects and styles. This year’s entries will be judged by four students and a staff member selected by mailing services. The winning entries will be displayed on the walls of the EMU for the next year. The contest will run through mid February, and entries must be submitted by Friday, Feb. 13. All artwork must be original and comply with copyright laws and avoid profanity. More details can be found at facebook.com/campuscopyducks and entries should be sent to artcontest15@gmail.com.